November in Austin means Fun Fun Fun Fest, one of several amazing music festivals in our fair city. Among the many awesome acts at Fun Fun Fun was Swedish singer/songwriter Lykke Li, who taped her first episode of Austin City Limits last Friday. She also became the first artist on ACL to have her taping streamed around the world by our friends at PBS. Lykke Li has one of the more unique artistic visions around right now – she and her five-piece band wove threads of indie pop, torch song, electronica, girl group pop, folk and garage rock into a rich tapestry that couldn’t have come off anyone else’s wall. Combine all that with her demonstrative stage presence and expressive voice and she’s a compelling performer – dramatic but never melodramatic. The good times still weren’t over, however, as she came back for another run through “Sadness is a Blessing.” There wasn’t anything wrong with the first take to our ears, but the second version was indeed tighter, more atmospheric and more powerful. “Do you want to stay?” Li asked before she launched into the new take – the enthusiastic response indicated how much her audience loves her. “Thoroughly enjoyed @Lykkeliofficial @acltv. Very impressed by the staging, abundance of percussion & the kazoo. And of course Lykki’s voice,” noted @aplarue on Twitter. 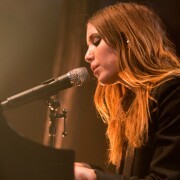 “Lykke Li. Great singer, excellent performer, captivating dancer,” said @BrionneVG. Perhaps @racerabbit put it best: “This Lykke Li show for @acltv is spellbinding!” See for yourself on January 28, when Li hits the ACL airwaves paired with Florence + the Machine. Don’t miss it!